The role of owner’s representative is its own separate niche, in many ways independent of standard architecture and engineering services, and it’s one that’s extremely important. When we fulfill these duties for a client, they are placing an enormous amount of trust in our team, and we take that trust very seriously. Here in this brief Q and A, FSB Education Principal Fred Schmidt outlines what these professionals do and the unique ways in which they help our clients. Q. Tell me about the owner’s representative role and what duties it comprises. A. Essentially, when you take on the owner’s representative role you’ve become part of that owner’s in-house team. You become the adviser, and with that comes a long list of responsibilities. The number one reason we’re there is to provide quality assurance and to make sure the client is getting everything they’ve contracted for from both the design and construction teams. As the owner’s rep we are basically interpreters of what the contractor is doing. We provide quality oversight, and we help the owner forecast what’s coming up, especially if we anticipate any problems. We outline the pros and cons, giving the owner the information they need to make crucial decisions. By doing this, we can successfully keep most projects on schedule and within budget by avoiding expensive change orders, construction delays or conflicts between the contractor and the client. Q. What specific tasks are involved in providing this quality control? A. There is a lengthy list of services that the owner’s rep performs, which can vary from project to project. 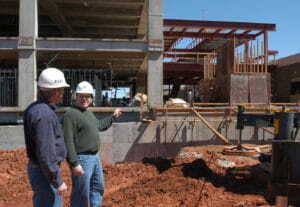 Some examples of these duties are: regular on-site inspection of the construction site; assistance with developing a master plan; facilitating meetings between the contractor, architect and client; ensuring compliance with all federal, state and local requirements; acquiring any needed permits; ensuring the contractor provides appropriate documentation and record-keeping; reviewing plans and specifications for their suitability to the project goals; assisting with acquiring and reviewing funding sources; reviewing contracts and handling change orders. Q. When do companies typically need an owner’s representative? A. The level to which owners may choose to engage depends upon two factors. The first is their ability to oversee professional services themselves, since many companies don’t have anyone in house with the necessary skill set. Others who have experience with many projects, such as higher education institutions, typically don’t need to hire someone, as they have staff who can handle what’s needed. There are exceptions to this, though. Sometimes government agencies or larger companies have so many projects going on at the same time that they need outside help to take care of them all, which is when they come to us. Q. How has the role of owner’s representative changed in recent years? A. The role has evolved over the last several decades, but again is primarily focused around quality assurance. This is also a growing service niche. The real change is that while traditionally this role has been filled by an architect, other professionals like project managers and construction administrators are increasingly assuming those tasks. However, it’s still more of a natural fit for architects because of our standard role in overseeing the entire design/construction process.